An in-depth and behind the scenes experience of the big, bold brand of SKOL that will bring out the fan in all of us! 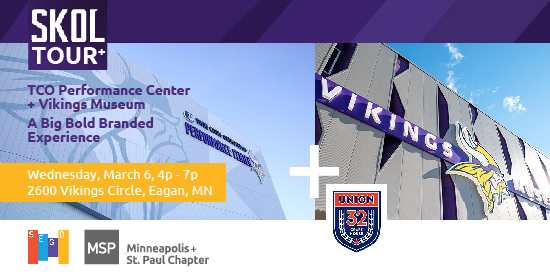 Tour the newly completed Vikings TCO Performance Center and the new Vikings Museum on the sprawling campus in Eagan led by Jennifer Haag, Founder & President at RISE Design Build Integration. Jennifer is amazing - her extensive experience with the MN Vikings is an exciting adventure with branded environments, wayfinding, and signage for the US Bank Stadium, Super Bowl, and the NFL. She worked with the construction management and real estate development teams on the branding, design and project management of the newly opened Twin Cities Orthopedics Performance Center and the ongoing development of the Viking Lakes campus. She knows all the SKOL secrets!! The tour is limited to the first 20 People - sign up today! After our tour, network with others in our industry close by at the Union 32 Craft House, an experience of craft brews at the Self-Serve Beer Wall—featuring 32 homegrown beers, lagers and ales including their own label brewed right on premise. The craft house networking is open to all. Please RSVP to the Chapter Chairs, Gretta or Jeremiah if you will be catching up with the tour group for a beer! SKOL! Join the SEGD Minneapolis Chapter for a guided tour of the newly opened Perkins+Will designed Bell Museum on the U of M St. Paul Campus. After being closed for three years the 146-year-old natural history museum has finally opened their doors to their brand new 92,000 sq. ft state-of-the-art facility. Housing more than 1.2 million specimens and 30 painstakingly restored dioramas, the museum and museum planning and design firm Gallagher & Associates (Maryland) set out to change the way we learn about natural history, art, and the environment. RSVP by 10/18 — we need to provide the Bell with firm numbers for the tour. Please arrive at the Bell Museum by 2:30 pm. Tour starts promptly at 2:50 pm and runs for 70 minutes. Directly after the tour we will be hosting a year-end happy hour at Stout's Pub (down the street from the museum). More information on the happy hour to come. Come join us for the NYE'S Piano Bar Re-opening Party! Featured speakers, Danielle Farchmin (Architect), Wes Winship & Nick Mamayek (Designers/Muralists). 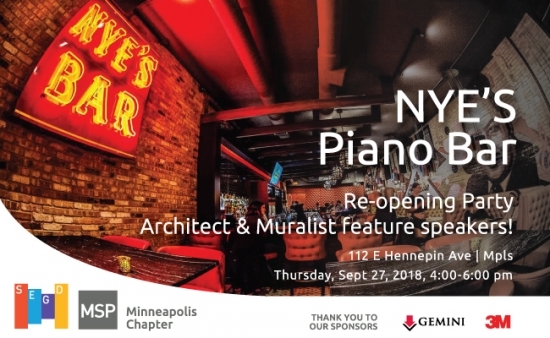 Learn about the design process on this historic project with deep roots and fond memories of the old Nye's Polonaise Room, which was on the same beloved corner for 66 years. SEGD member Nancy Ann Coyne’s Speaking of Home, is a 600 ft public installation and environmental design project transforming four of St. Paul’s famous skyways at the heart of St. Paul’s downtown, into an episodic narrative of immigrant experiences––questioning our assumptions about the meaning of home. The project marks the first time that the St. Paul skyway system will be sanctioned for a public installation and was made possible by the close collaboration between SEGD members, Coyne, Archetype. and Engrafik’s principal, Mike Haug. Speaking of Home explores the meaning of home for Twin Cities immigrants and refugees through their own family photographs brought from their native country, with accompanying stories. 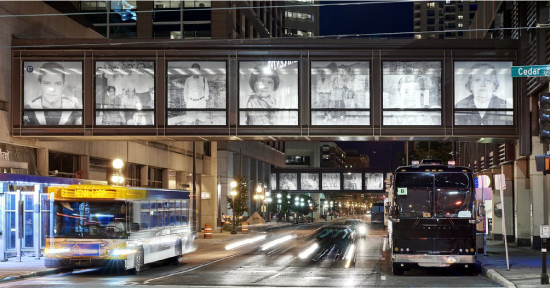 Each larger-than-life photograph is printed on a translucent scrim and installed in the windows of four connecting 77-foot skyway bridges––a network of over five miles of second-story glass and steel pedestrian walkways over the city’s downtown commercial zone. Employing 58 semi-transparent, black-and-white photographs, the installation’s design enables 30,000 skyway pedestrians to view the city through new Americans’ eyes as thousands of street-level commuters and motorists engage with 58 faces that gaze directly onto the city. Throughout the day and night, the elevated bridges appear as stunning architectural lightboxes. The emotionally moving public installation is accompanied by text panels with individuals’ biographies, interview excerpts describing what they gave up or fled from, and the lives they have created in Minnesota––all accompanied by overhead panels with the word “home” in their native languages. To create the project, Coyne pioneered the establishment of a new city ordinance permitting artwork in the 50-year-old St. Paul skyway system. According to native New Yorker, Coyne, “Speaking of Home is designed to invert the divide between the native-born and newcomers, situating immigrants as stationary onlookers as the locals pass by and move through the city. Conceived for St. Paul, a sanctuary city, it’s an homage to the Twin Cities’ rich immigrant community––several blocks from the Minnesota State Capital, where legislation concerning immigrant rights is enacted. Nationally, Amy Klobuchar have been outspoken immigration advocate. Starting with northern Europeans some 150 years ago, a vibrant immigrant population is a core part of the personality of the Twin Cities, which are now home to the largest Somali and Hmong populations, and the second largest Tibetan population in the United States. What is more, students enrolled in Minneapolis and St. Paul public schools speak over 120 languages. The family photographs shared by the Twin Cities’ immigrants are among the few physical reminders they’ve retained from their lives before coming to America. Coyne researched the lives of hundreds of individuals of all major religions, sexual orientations, and backgrounds from six different continents for the project. Coyne believes that the installation’s message will be clear: to empower immigrants and draw attention to their lives, struggles, and contributions through the power of design and the arts. At a time when the country is more divided than ever––with looming travel bans, the potential disintegration of the Dream Act, and a steep rise in white nationalism––the project serves to open the public’s eyes to contrasting stories that embrace the human experience as well as create awareness and empathy for immigrants’ lives and struggles. 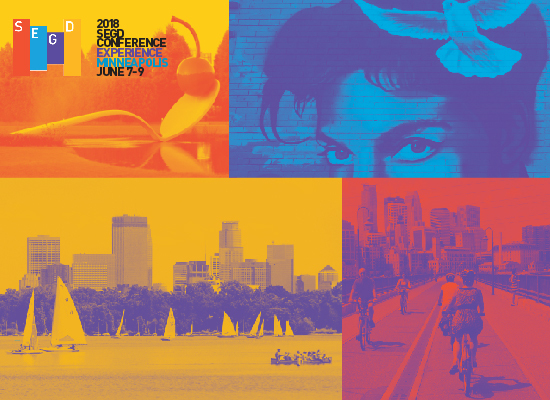 Summer has arrived in Minnesota and SEGD MSP is excited to host the SEGD community and inspire you with all the city of Minneapolis has to offer in its summer glory! 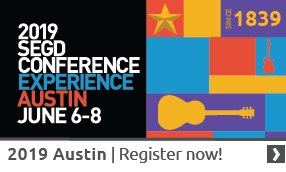 There is a full conference itinerary, but time to explore more around the city. Here are a few of mine and my urban friends’ recommendations with some pretty good reasons why and websites to fill in details. Travail, because sometimes things are so good you have to go the extra mile to experience the innovative world of travailkitchen.com. Thank you, guys - I'll see you out there!